I’ve been in the throes of a bit of an existential crisis lately. Driving an old Honda Prelude Si helped with that. Did you catch the news out of the Detroit Auto Show? Besides that awesome coupe from Lexus that is being made, and that awesome coupe from Buick that will never be made, there wasn’t what I would call a huge glut of products in the pipeline for us. You know, people who love to drive. While previous Detroit shows brought us the new Ford GT and Corvette Z06, this one felt a bit dry. This year Ford’s big news was an app. That’s depressing. Detroit felt like an extension of the CES tech conference in Las Vegas, now an auto show too, where the big news was “mobility” and more screens in cars and gesture control for infotainment and self-driving cars. I understand the solutions the cars of the future may present for traffic, road deaths and pollution, but I also foresee hard times coming for people who like to drive themselves as we creep toward the autonomotive singularity. I needed a break from all that noise. And I got one recently. While those rubes on the East Coast were up to their elbows in snow, I took a long Texas Hill Country drive on a sunny, breezy 65 degree day in this 1991 Honda Prelude Si. I felt better afterward. This isn’t just any Prelude Si. It’s a damn near perfect example of the breed, an unmolested survivor of the apocalyptic Tuner Car Wars of the 1990s and 2000s (#NeverForget), a clean and stock example of Honda’s long-abandoned sports coupe. It had a few quirks you might expect from a 25-year-old car, namely a belt tensioner that may need replacing and some finicky synchros, but overall it ran great. Hell, it ran better than some newer cars I’ve owned. The sunroof even works! You think the sunroof on my Mini worked all the time? This Prelude is owned by a friend in Austin who also owns that Lexus LFA I wrote about last fall, and an NSX, and a Toyota truck, and a Honda sportbike. He has good taste, likes to share his toys, and is a supremely cool human being. So why, with these things in his garage, did he end up with a relatively humble Prelude? “I saw it on Craigslist and was like, man, you just don’t see stuff like that anymore!” he told me, meaning such untouched Japanese iron. This was the car he wanted in high school, too, when at the time he was stuck driving a beater Chevy instead. Our friend picked this up for just $3,500, a steal compared to some of the battle-scarred and badly-tuned Preludes you find on Craigslist for far more than that. The Prelude deserved a better end than it got. 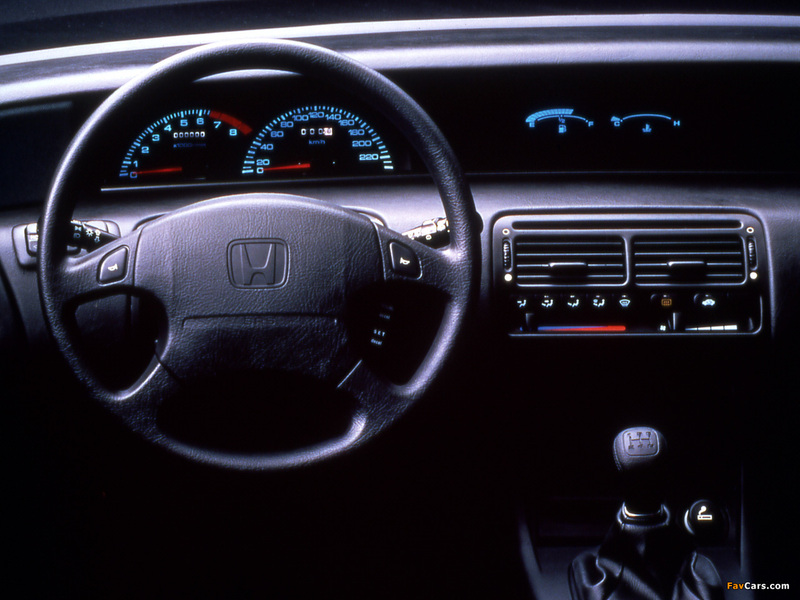 Over its nearly 25-year-history it was, essentially, a very sporty Accord coupe; but the Preludes were also a testbed for some of Honda’s more interesting technologies. It was the first mass-produced car to have four-wheel steering. It was among the first cars with VTEC. The clever use of dashboard real estate was well ahead of its time. Like I said, this car is a 1991 model, making it the last year of the third-generation models. It’s powered by a 2.0-liter fuel-injected DOHC four cylinder engine putting down 135 horsepower at 6,200 RPM. Alas, the only downside to this fine example of Preludery is that it does not have the legendary four-wheel steering system that famed British motoring journalist LJK Setright thought was the crowning achievement of human civilization. But the driving experience doesn’t suffer for lack of that. The cars of the late 1980s and 1990s are quickly emerging as “sweet spot” cars for drivers. For the most part, you get a car that is easy to understand and straightforward to operate by modern standards, but without the complications of carburetors or infotainment systems that came before and after, respectively. I didn’t realize the treat I’d be in for as we drove out of Austin and onto my favorite back roads south of the city. The Prelude Si was damn good car in its day, and even today it’s extremely fun and deeply rewarding to drive. Fine-looking car, too. Especially in this gentlemanly black shade. Hey, remember when nearly the entire Honda lineup had pop-up headlights? Good times. Most of the Preludes were attractive cars, but this generation is my favorite. Inside... first, let me ask, has Honda ever made an interesting interior? Ever? Because despite some delightful period quirks like the carpeting on the door panels and an odd placement of sunroof controls, it’s all straightforward to the point of almost being boring—unlike some genuinely weird ‘80s and ‘90s Japanese cars, like an Toyota MR2 or Subaru XT. Then again, on the plus side, it’s super easy to figure out because there’s really nothing to figure out. You just get in and drive. No drama whatsoever. Also, the seats are fantastic, providing surprisingly good levels of bolstering all around. The first thing I noticed when I drove the Prelude was how low to the ground it is. Find me a modern coupe besides the Miata that’s this low. You can’t. The second is the ultra-thin A and B pillars, relics from a different era of safety standards. Visibility! It’s been a while. I’ve missed you. It’s a momentum car for sure. It’s not slow, but by modern standards where turbos are everywhere and torque comes cheap and easy, the 2.0-liter four feels pretty anemic down low; like any proper Honda, you have to get the revs up to get anywhere. Do that and it’ll do 80 mph on the highway or a twisty country road with exactly zero problems. Curb weight’s a mere 2,639 pounds, too, and that helps. It’s a smooth, playful, eager engine with a pleasing mechanical sound. It comes from an era when you could actually hear cars without needing their engine noises fed through your speakers. The five-speed manual is a winner too. (The Prelude came in automatic form too, but... why?) It’s not as bolt-action precise as the gearbox on the NSX, or the S2000 that came nearly a decade later, but it is crisp, easy to find gears with and with short throws. I have no doubt this was among the best gearboxes of its day. And it’s fabulous in the corners too, as you might expect. The Prelude’s front-wheel drive layout keeps it from the tail-out heroics you get in a car like an NA Miata, but it’s still tight, direct, light-feeling and with zero body roll. The steering, while a bit loose on center, delivers more feel than you’ll get in any modern car. With Initial D music blaring in my mind (Was there a Prelude in Initial D? I don’t think so, but whatever, same era) I laughed with my friend as I tackled one sweeping corner after another, the Texas winter sun beaming down on us. The thing about the Prelude is it doesn’t suffer from not being a balls-out, extreme rear-drive sports car. Quite the opposite. It’s a first-rate jack of all trades car. It handles very well. It’ll move well enough when you get it going. The ride quality happens to be superb. The back seat is decent and so is the trunk. Usually I offer to buy someone a tank of gas when I talk my way into their car, but we barely used any on our jaunt. This generation of Prelude kind of excelled at everything. “It’s the car I most want to take on a road trip,” he said. “If this was my only car, I’d be happy. I’d have no complaints.” High praise, I think, coming from a guy with an LFA. The Prelude Si was just a fun car to drive. Let me repeat that: just a fun car to drive. No infotainment system to deal with, no navigation, no lane departure warning systems to turn off, no automatic braking, just. A. Car. That you drive. And without the headaches that come with much older cars, too. I don’t know what the future holds for people like us, people who like to drive. Even in this last great era of human driven speed, with incredible advancements in safety and power and efficiency, we have lost a great deal of that human-machine relationship that makes cars like this one so worth driving. Maybe those further advancements into electrics and autonomy will kill pollution and traffic deaths forever. Good for us if so. If anyone needs me, I’ll be in something like this Prelude, even if only for brief jaunts to stave off an existential crisis.